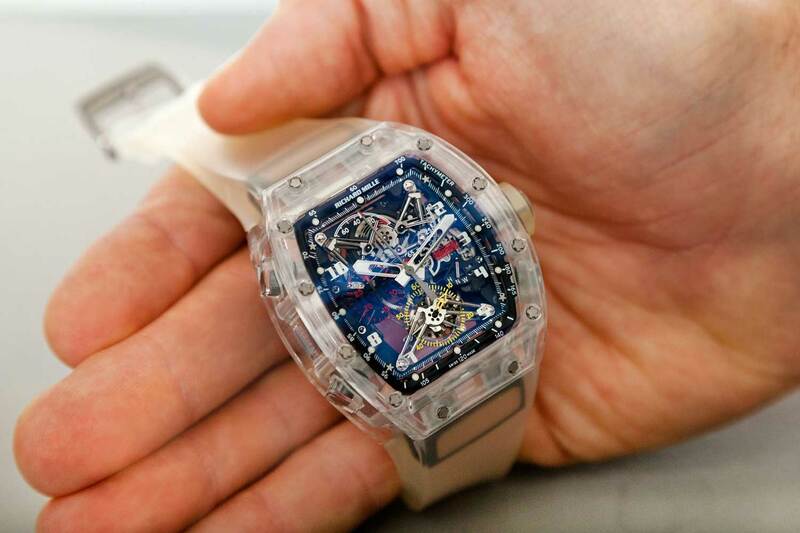 Revolution recounts the various sapphire watches that Richard Mille has embarked on in light of a prototype version of the RM 056 that has surfaced in Christie’s 21 June 2017, New York catalogue. Now, one reason why we hardly ever see watch dials with radically different faces that deviate from the typical round or four-sided shapes is simply because the crystal of choice used to cover the dial in the industry — sapphire — remains an unyielding material to work with. Not to mention that the clear crystal is rather brittle and doesn’t take too well to unusual cutting angles. What we see in the market is therefore the simple result of feasibility. 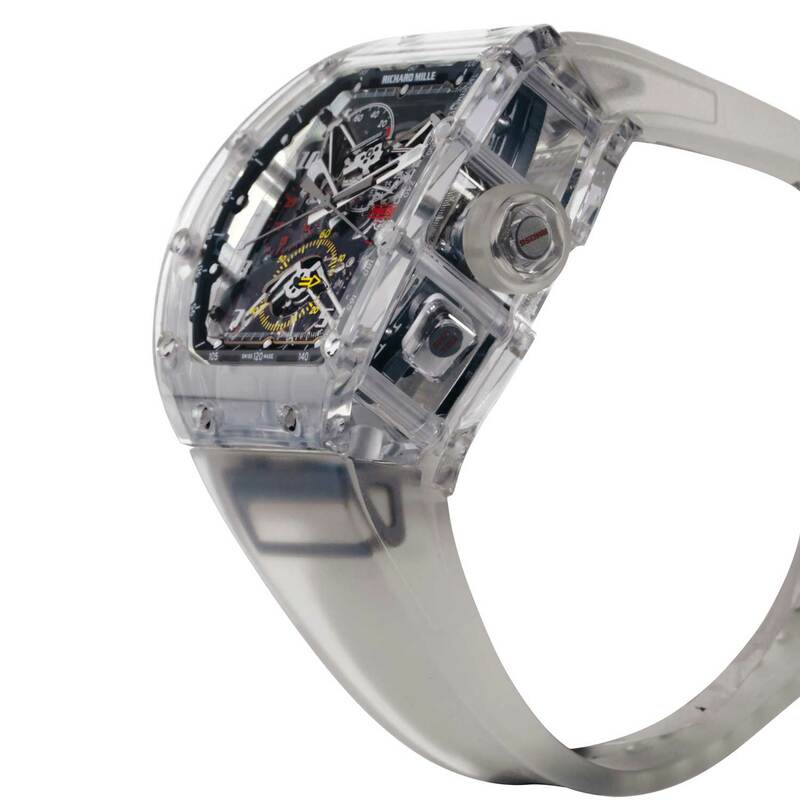 But, when has feasibility ever been a consideration for the indomitable Richard Mille? 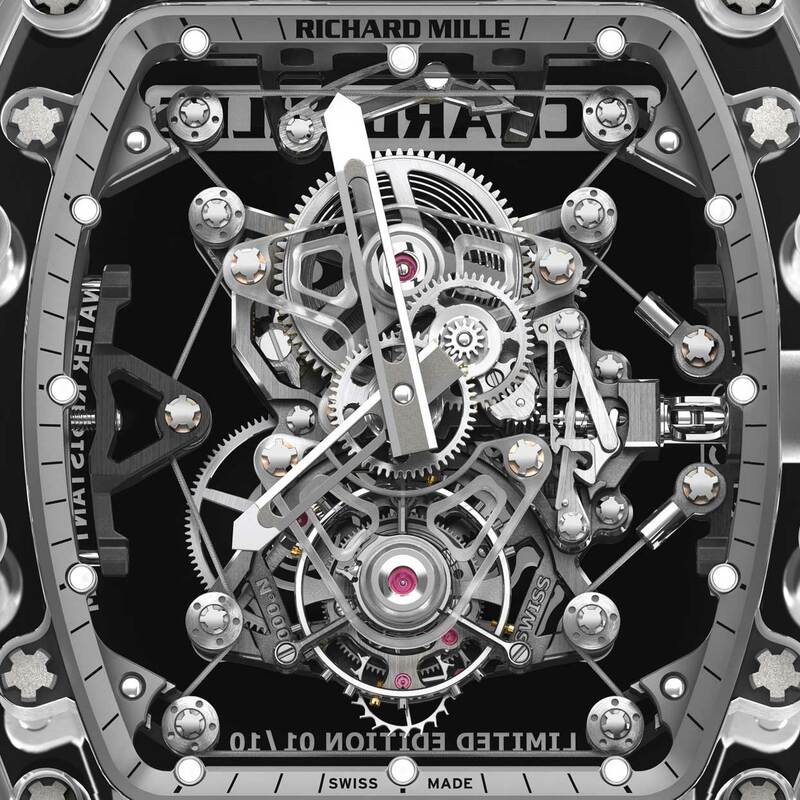 In 2012, Mille’s milling ambition led him to introduce the very first RM 056, which boasted an all-sapphire case in the familiar Richard Mille tonneau shape. It was an engineering marvel like none before, requiring no less than 800 hours of machining. The all sapphire case offered a breath-taking view of the split-seconds-chronograph movement within. A similar movement to the one found in his RM 008. The case, bezel, middle and back of the RM 056, had to be milled from solid blocks of sapphire using a diamond-tipped cutter, and thereafter, held together by Mille’s signature spline screws. The screw holes themselves were a challenge and had to be milled with extreme precision, with little margin for error, due to the brittleness of sapphire. One slip up and the entire block of sapphire might possibly crack and become useless. 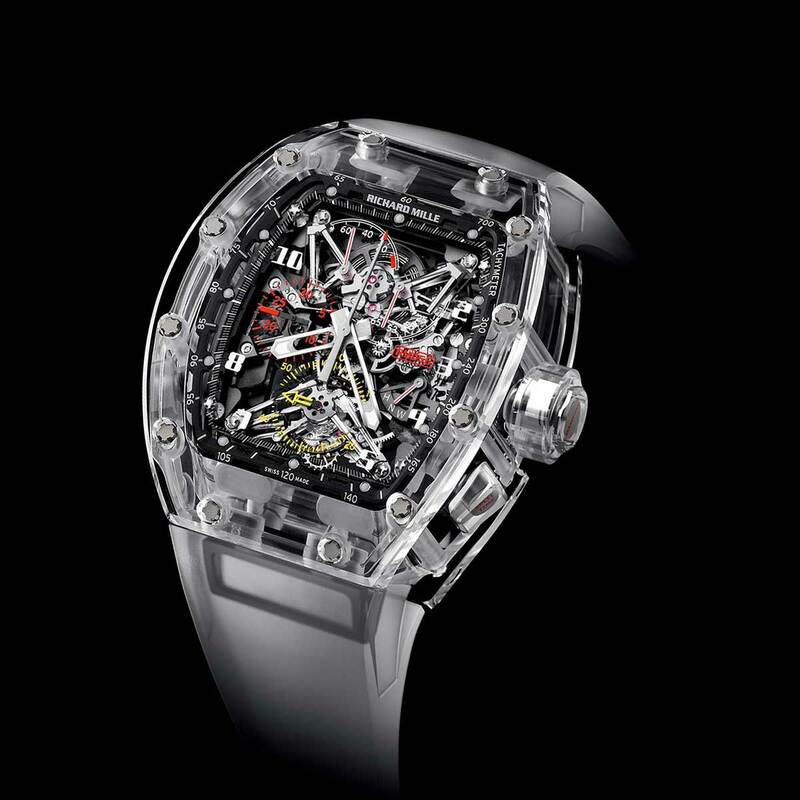 The complexity of the process was of such a high level that Richard Mille only made five examples of the initial Tourbillon Split Seconds Competition Chronograph RM 056 Felipe Massa Sapphire. But Mille, of course, is not one to simply stop at having successfully constructed an all-sapphire watchcase. 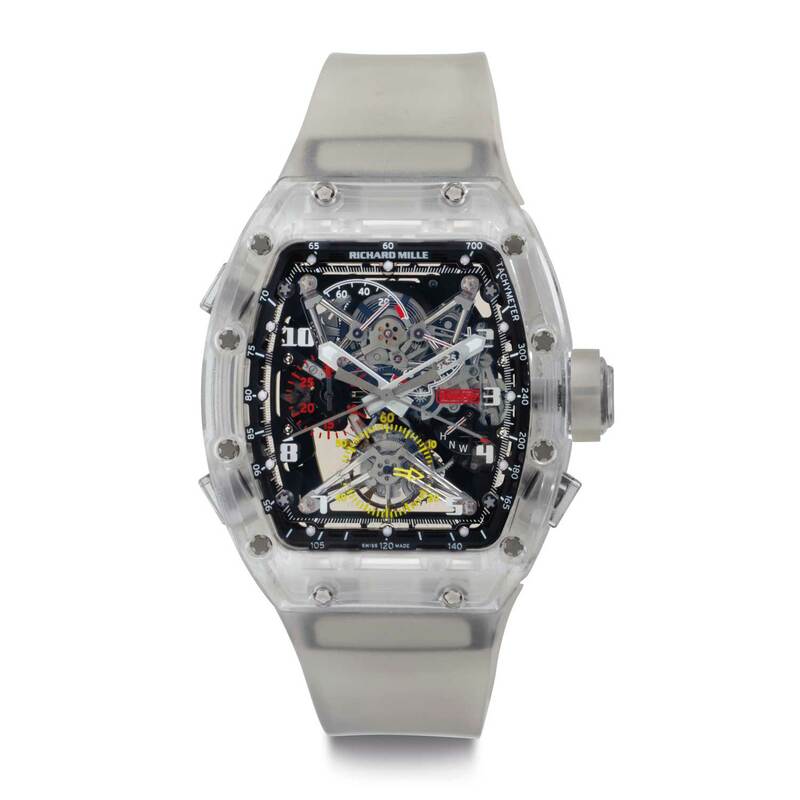 In the following year, Richard Mille introduced the RM 56-01 Sapphire Crystal, which, on top of having an all-sapphire case, also had its movement’s baseplate, center bridge and third wheel made out of sapphire. In fact, the sapphire baseplate was even ribbed in pursuit of a fundamental goal of Mille’s: Lightness. Then, in 2014, Richard Mille yet again took things a step further with the RM 56-02 Sapphire Tourbillon, where the entire mechanism within the watch — tourbillon and all — looked almost like it was afloat in space. 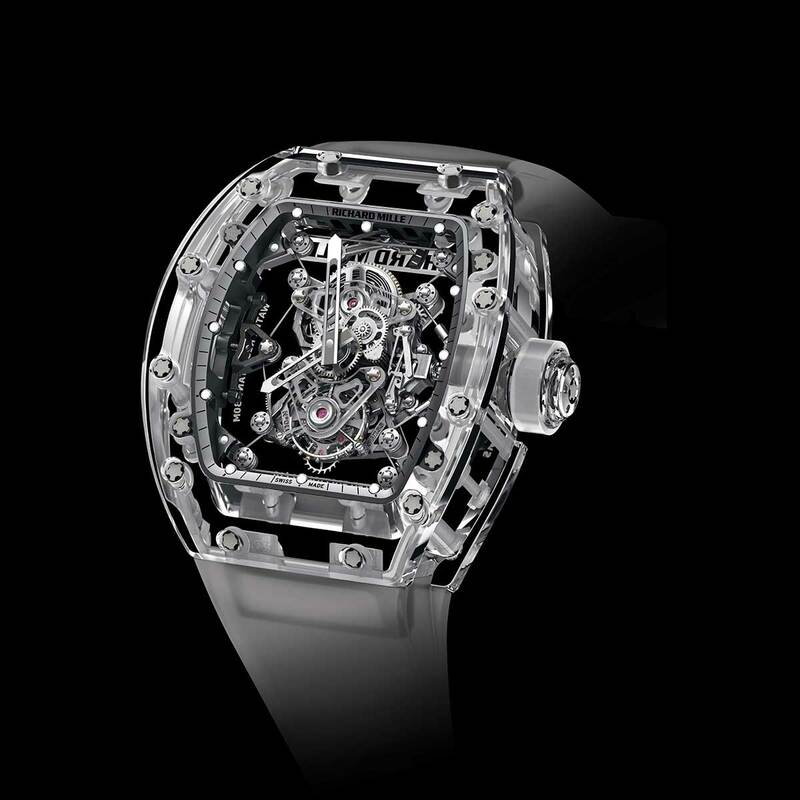 In order to create this illusion, the titanium baseplate of the RM 56-02 was extensively skeletonized. Thereafter, the gear train and such were affixed to the plate with sapphire bridges. However, the real reason why the movement within looked like it’s held in suspension is because it is, in fact, held suspended from the sides of the sapphire case with an audacious cable-and-pulley assembly. 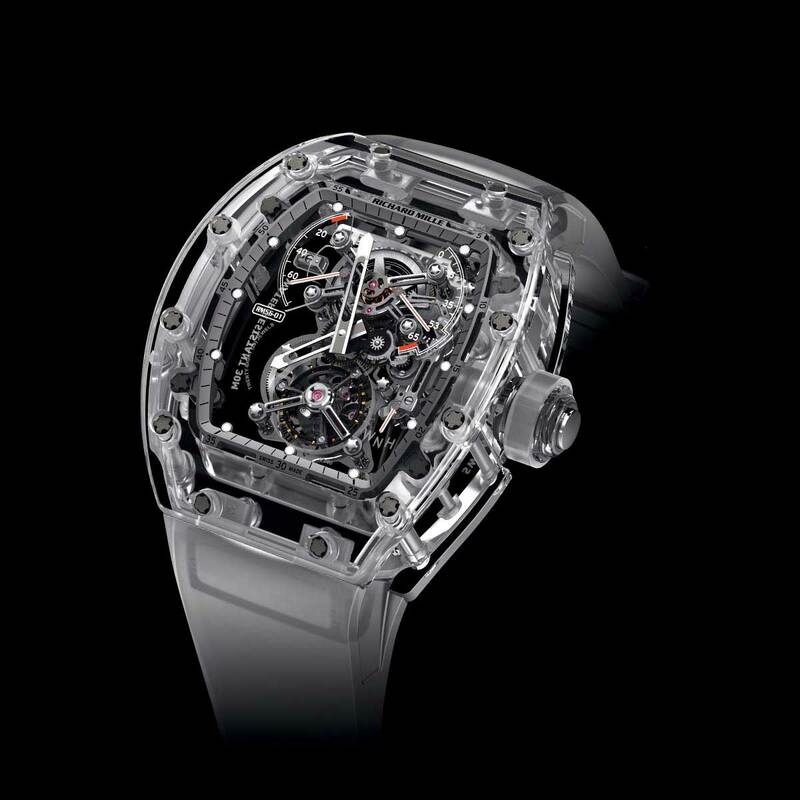 Clearly Richard Mille was slowly and surely becoming bolder in the way he was able to manipulate this challenging material. The RM 56-02, for instance, saw a total of 10 examples created, as opposed to the five pieces in the two previous versions. Thereafter, in 2015, we saw him celebrate the 10-year anniversary of his friendship with Felipe Massa by issuing the RM 056 Tourbillon Chronograph Sapphire – Felipe Massa. In 2016, he issued yet another sapphire-cased watch, the RM 056 Jean Todt 50th Anniversary edition. There was even the extraordinary RM 07-02, which had a pink sapphire case. However, it goes without saying, that in the entire sapphire saga of Mille’s, no version can be considered as special as the original RM 056. The one that started it all. Now again, remember, there were only five RM 056s made. But what about the rounds of prototyping and development that Mille had to go through? Could that process have yielded examples of complete watches that weren’t counted towards the final five and, therefore, be more important pieces in the story? Christie’s 21 June 2017, New York sale catalogue suggests that there were at least two RM 056 prototypes. Number two being the one that’s been listed in the catalogue for sale. There’s no telling for sure how many there may be out there — unless the folks at Richard Mille speak up about it — but it goes without saying that a prototype RM 056 holds historical significance the likes of which can be compared to, possibly, the white gold prototype Royal Oaks created using Genta’s original 1971 drawings. 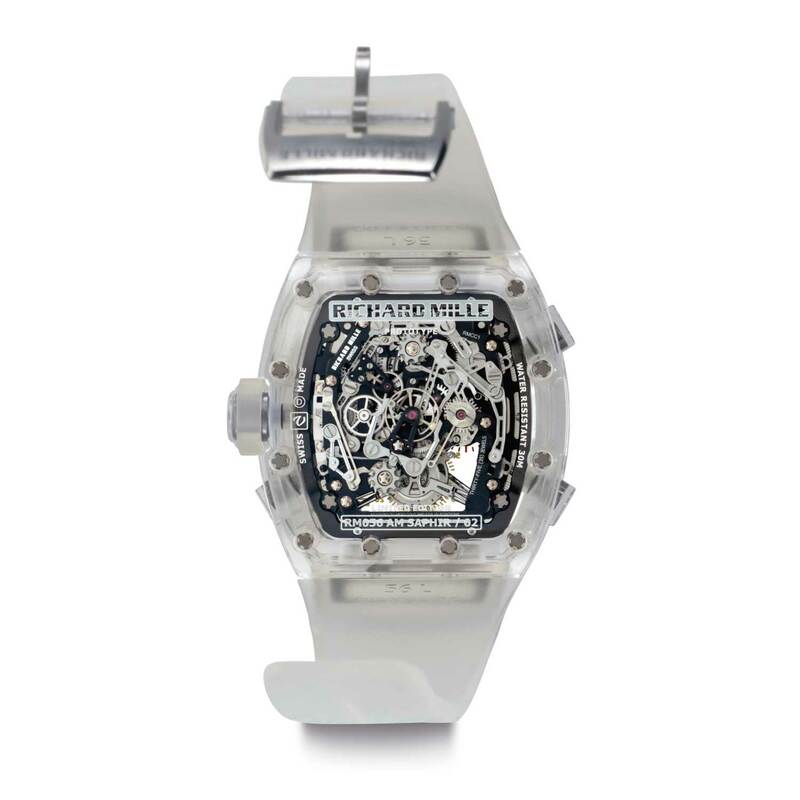 The watch is listed to go for between USD1,000,000 to USD1,500,000, which is fairly conservative when you think about the fact that each of the five production RM 056s went for USD1,650,000. Not vastly different, for sure, but in light of the performance of the early Richard Milles owned by Laurent Picciotto at Phillips’ recent Hong Kong auction, it is going to be interesting to see how the estimates are pushed. You can find the watch listed on Christie’s website, here.